Hello, friends! I've not been as present, here on my blog, as I'd like to be so I thought a bit of updating was in order. My in-person teaching schedule has changed a bit. You can see my venues for this year, in the left sidebar of this blog. DTUC (due to unforeseen circumstances) I won't be at Coronado, this year, but hope to be next year. In August, I'll be teaching in Phoenix, at Art Unraveled. LOVE Art Unraveled! I'm so happy to say that my classes are all sold out but for a few spots in my Alchemy of Objects class. Thank you all and I can't wait to see you there! Also in August, I'll be at Spring Beads, for the first time. Spring Beads has a wonderful workshop space and is just down the road, a bit, from my stomping grounds. I'm teaching An Equisite Fusion, which is a take off of my popular online class, Of Towers and Turrets. It's gonna be a great class. I'll also be teaching my bangles class. This class is so much fun and I'm always amazed at the lovely student work that comes from it. Ya'll are just so creative! In early Oct. I'll be in Stamford, Conn. for Art is You. This is a new venue for me and I'm excited to get back to the East Coast. Plus, Number Two son will be attending culinary school in New York and I'll have a chance to go see what he's up to. I'll be teaching three classes: Entrada, Wildwood Earrings and A Charming Reliquary. Then, at the end of Oct, I'm thrilled to be going back to The Prairie, here in Texas. This was such an incredible venue and the spirit of creative comradery was outstanding. I'm not sure what I'll be teaching, just yet, but the class schedule will be up really soon...maybe within the next few days. You should sign up early as there are lots of students who are dying to come back to this one. If you come, you'll love it. I promise. 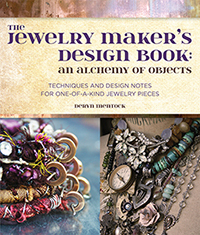 If you want to know about my online classes (and where I'll be teaching, in person) Jewelry Works is my other site where you'll find all the info for all my classes. Speaking of which...some of you have been patiently waiting for my BoHo Bliss e-course to be offered again; wait no more! Registration is open for that workshop which starts June 15, 2012. Yes!...I'm working on some new online stuff and hope to have that ready for the fall. So...I've been looking for ways to make it easier to follow me and I found this awesome QR code generator. Have you seen this? It's so cool! Here's the dealio: if you have a smart phone or ipad, you need a bar code scanning app to use these QR codes. I have one called "bar code scanner" on my android phone. You open the app, point your device at at this square of code and...presto!...it generates the link to my blog. Then you can just tap on the link and zip on over. My app has a history button so I tap that and it shows me all the links I've scanned so I can easily follow them. On my Jewelry Works site, I've added this code that you can scan to follow my in-person classes. So groovy! Go there...make your own QR code...it's fun. I've become addicted to Instagram and have added a little Instagram badge to my right sidebar. If you'd like to see my photos there, just click on that cute little brown camera icon. And, guess what? Once you get there, those clever Instagram folks have kindly added a QR code for my page so you can follow me there...which is how I got started on the QR codes. Isn't technology amazing?! In addition to all of this, ya'll can follow me on facebook and twitter, of course. Some of you may not know but most of my day-to-day stuff goes on over at facebook. I actually have a personal page there, and a professional page. I've never figured out why we need two, but...so be it. There are two little, tiny icons in the right sidebar of this blog that you can click on to take you to my fb or twitter...if you tweet. I gotta say, I'm the world's worst tweeter. Sad face. If you're looking for me, on the web, I probably should also mention my poor little Etsy shop. I've not done much with it lately but I do have a few pieces of jewelry listed there as well as a couple of awesome tutorials. And then there's Pinterest...my other new addiction. Wow, this site is just one giant inspiration board. If you'd like to see my inspirations, you can click here and, of course, hit the "follow" button. Ok...that just about covers the major places I can be found and followed, if you're so inclined. If you do visit me, please, leave a comment. I love hearing from you. Plus, it justifies my internet addictions. Hello, my friends! If you've been waiting for the return of my BoHo Bliss class...it's baaaack. Registration is now open for the summer session...just click here for info. Let me tell you, my students just loved this class, last summer, and so did I. These hoops are just so addicting to make! Lots of you have been waiting for this class; now is your chance to get it. I'm not sure when I'll be offering this one again as I've got new stuff in the works. Speaking of works, pop over to my Jewelry Works site to see a few more photos of these lovelies. I'm still purging, folks! Boy, it's a slow process. I'm digging through stuff I haven't seen in quite a while! I've gone through the first batch and most of the Industrial Chic things are gone but I've got lots more "junque" for you. If you're interested in a studio purge grab box, please email me at mocknet@sbcglobal.net and I'll send you a paypal invoice. Boxes are stuffed full...$35 (including shipping which is a whopping $11.35! )...sorry, no returns and no international, just so I can keep my sanity. Thank you for helping me purge. I may just get that new workbench into place, yet! $35 per box...email me at mocknet@sbcglobal.net if you want one! As someone who loves to create, I've gathered all kinds of things to feed my need to make stuff. Stuff that was on sale, stuff I thought I would use but never did, stuff I couldn't resist! However, my creative space is very small. I'm in the process of re-designing my space but am feeling the need to clear out supplies I no longer need. And, so I say to you...let the purge begin! I ran across this fabulous idea (thank you Nina)...a way to share some great stuff with you and destash my studio, all at the same time. I'm packing it up into flat rate boxes and moving it out. If you're interested, please email me at mocknet@sbcglobal.net and I'll send you a big fat box, stuffed with stuff. Sorry...no returns and no international shipping...paypal only. Thanks for helping me purge! I Have Bitter Yuck On My Tongue...Again! My life has changed drastically. And, here's the reason why. She pretty much behaves in this wildly spastic manner whether we're at home, at puppy school, at the vet or...well...just about everywhere. I love my spastic little pup. But, you see my point? She hates to have her picture taken. She seems to enjoy Bitter Yuck. ...and a totally inspiring and peaceful atmosphere, perfect for a weekend of creating. Art Retreat at the Prairie is a not-to-be-missed art event. I can't imagine a better place for an art retreat. The Ranger Lounge was our classroom...purely delightful. I've got tons of photos to show you because words just can't describe how lovely this place is. But, let me begin at the beginning...The grounds are beautiful. Everywhere, you see Rachel's touches. There are several charming guest cottages and outbuildings. This is one of them...can you imagine cozying up here for your creative weekend? I can totally see myself sitting right here, at the end of a day of teaching; daydreaming with a glass of wine in my hand and gazing at this adorable glass house. Everyone should have a glass house to gaze at. Just look at those jing-tinglers. I want one! Don't you? I was intrigued by Rachel's pastel stash of shabby chic goodness. It's an interesting blend of deconstructed elegance, rich detail and simplicity bordering on austerity. The style is oh, so pretty! May I please move in? Please, may I snuggle up in this big bed with a good book and a box of chocolates? Or, perhaps this one, after a hot bath in the claw-foot tub? I'm telling you, I would sleep like a baby in this house. It's the kind of house I've always dreamed of. Breakfast was served, every morning, cooked by The Prairie's resident renaissance man, Danny. I don't have a photo of him but, trust me, he looks like he can do pretty much anything. Turns out, he can...and he can cook...real good. Our sweet and lovely organizer, Barb, took such fabulous care of us. I've never had a classroom set up as beautifully as this. Thanks to Barb, this is what greeted each student when they came to class. Barb, and here sweet daughter, Erin, created these adorable potted place markers for each and every one of us. And, get this, they created these gorgeous necklaces for each student. The students were seriously spoiled...and happy. Happy students make me happy. Here's the crew. Diane Cook (left) taught...and Barb (center) ran around making sure everything went smoothly while, at the same time, being a student. She's got a lot of energy. I was worn out, just watching. And, she looked fresh as a daisy, at all times. I looked like a wilted dandelion, most of the time. But, we had SUCH fun. I'm talkin' serious fun. They even let us mess up the wonderful covered porch area, in the back. And, Diane got to ride a little, bitty scooter. And just look what they made. Creative students. Awesome students. Love. The food. The food was to die for! Barb had a handy meal plan for us so we didn't even have to leave the property but, one night, we did. We had dinner at the famous hot spot, Royers, in Round Top. I can safely say, this was one of the best meals I've ever eaten. I was very nearly incapable of waddling back to the car for the ride home. And, guess what? We're going to turn right around and do it all again in the fall. It's pretty fabulous. If you like to be spoiled, and pampered, and hang out with like-minded, creative gals. I do. I really, really do. I think Barb is still working on the site but, when she gets all the details up, you can see them HERE. If you're interested, you should contact Barb and let her know. Her email is on the Art Retreat at the Prairie site. Right now, there are a finite number of spots for students and I'd hate for you to miss out. If you do come, make sure you bring your cowboy boots. The Prairie is a place you can rock your boots and enjoy a good tutu...all at the same time. See ya'll in the fall!